Here’s a quick review of another excellent panel at the 2007 IASD conference. Apela Colorado, lead professor at Wisdom University, chaired a panel of three of her graduate student on the topic of ancestral dreams. These four powerful women shared their journey of coming to know who they are through the process of remembering and honoring their heritages. According to Colorado, dreams are one way the ancestors “speak.” By cultivating these dreams, she insists, we can come to know not only our forgotten lifeways, but also the traumas that haunt our heritage. Researching your heritage is not all ancestral rainbows and butterflies… it’s work. Erin Langley shared the database she is developing to track ancestral dreams. Although for now it is only open to other students, she is planning a version that the dreaming public can submit to. Check out Erin’s webpage for updates. One of the many insights from this database is that most dreams were recorded during the waxing gibbous phase of the moon. This could potentially be a powerful research tool for anyone interested in dreaming with the ancestors. Finally, Teresa McCall gave a soulful talk about her research into Celtic mythology, discussing how St Patrick rid all of Ireland of not only the “snakes”, but also the dreamseers. She concluded with some advice about cultivating ancestral dreams that she received from an Aleut elder. Don’t get attached to a powerful experience. Get the message and hang up the phone. Watch carefully in the dream: be a witness. Be careful of the ego…. we can often crush a message without even meaning too by our gaze alone. Look at fears when they emerge. Face them, but act out of love, not fear. Integrate the emotions that come up in a dream into waking life. Remembrance, dream sharing, ritual and art all can help with this. Don’t get in the way of someone else’s process. It’s not the way you”d do it, and that’s good! All of these women imparted a sense of hope for the future. Apela Colorado’s message is that the cure for American culture’s “melting pot indigestion” is to know who we are, where we came from, and where we live. By dreaming our ancestors, we meet them halfway. Update (7/30/07): erin Langley’s website is now open! 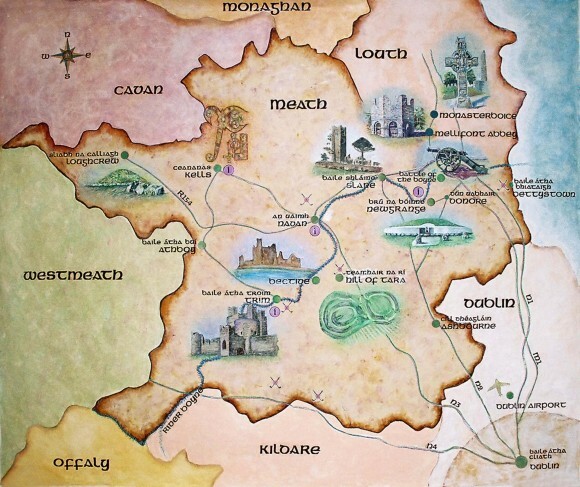 And here is the mural she painted while in Ireland last summer, depicting some of the ancient sites in the County Meath. I”ve got heritage in the County Meath, too: unfortunately, the Dungan Clan’s castle has been a pile of rubble for almost three hundred years already.